are used for cross-country skiing and hiking. The Parking lot and trail head is located 1 mile west of Paradise on M-123. Tahquamenon Falls State Park Trail Map for skiing and hiking. Copyright 2002 by vivian wood , webmaster. All Rights Reserved. Except as permitted under the Copyright Act of 1976, as Amended, this web site may not be reproduced in whole or in part in any manner. 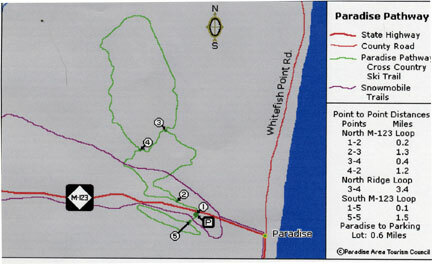 Unless authorized by vivian wood, the webmaster, reproduction of any picture, web page or pages on this website, www.paradisemichigan.org, for placement on the internet is a copyright infringement. All right, title and interest in and to the material on the web pages, the web site, in whole or in part, and in and to this url and the urls contained within, is the property of the webmaster. All website design, text, graphics, selection and arrangement thereof are the copyrighted works of vivan wood Web site created on an Apple G-4.